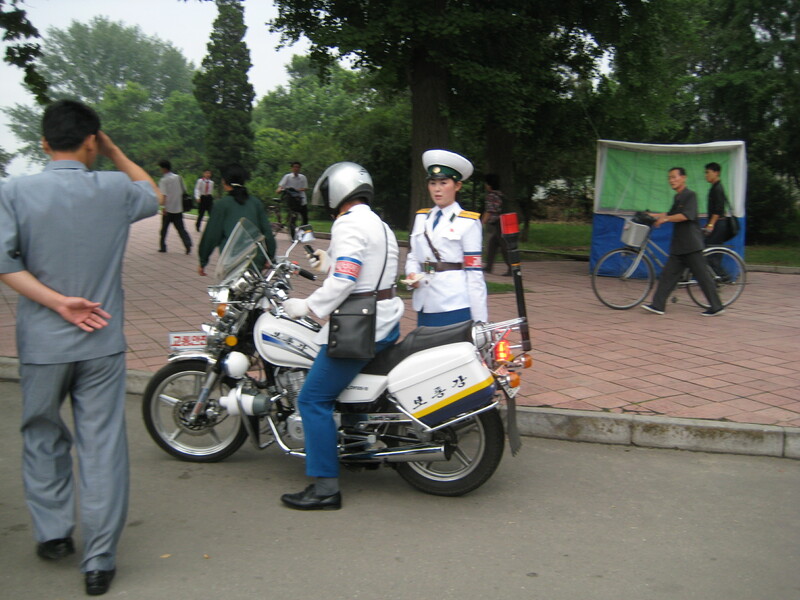 The Pyongyang Traffic Girls are slowly being replaced by traffic lights. The image of the North Korean traffic controller is familiar to those who follow North Korea: a man or woman in a blue and white uniform and white hat, directing traffic at a four-way intersection. Documentaries on North Korea are populated with images of traffic controllers in action, where they serve as a visual signifier for the brainwashed and robotic populace of North Korea. A North Korean film (after which this article is titled) about traffic controllers presents a vastly different picture—the protagonist sees her role as not limited to directing traffic but as also being involved in the community in which she works. The perfect symbol, the traffic controllers can come to reflect the viewer’s thoughts about North Korea. Perfect robots, as the journalists see them, or model citizens, as North Korea (per the film) sees them? In 2009, I only saw the traffic controllers as we sped by them, going from site visit to site visit. Still, for the first few days of the trip, I kept my eyes out for them. I was curious to see if they were anything like they were portrayed in documentaries. After several days of driving past multiple traffic controllers, they became differentiated people—no longer a symbol of anything, they were just people doing their jobs. After the initial novelty wore off, they became part of North Korea, and just as I got used to the differences in fashion, in vocabulary, and in cultural behavior, I stopped seeing the traffic controllers as something out of the ordinary. They also became part of the picture of North Korean progress. The state had started implementing traffic stations: round, raised platforms with a massive umbrella-like structure placed at the center of selected intersections. Our then-guide explained that the platforms we saw were part of a pilot program, and if successful, they would be implemented more widely. I had an image of returning to a North Korea that had such platforms at every intersection, all traffic guides properly shielded from the sun or rain. We hear that the DPRK is a relic, a state that has inexplicably, irrationally stepped off the path of progress and modernity. Going once is like taking a snapshot—you see slices of North Korean daily life, meet with students, workers, and farmers, and from the sum of 11 days’ worth of experience, you develop a picture of what North Korea is like. But if you don’t return, the picture remains static. Nabokov said, “One cannot read a book: one can only reread it. A good reader, a major reader, an active and creative reader is a rereader.” I think the same can be said of places and experiences. The second, third, and fourth times allow you to engage more actively and think more deeply about what you are seeing and experiencing. On my 2009 trip we had a few people who had been to the DPRK before, and I heard several times about how different things were from the previous time. Despite this, I wasn’t quite prepared for all the changes I saw on my return. These ranged from fashion (platform shoes, more stylish clothes), technology (way more cell phones), construction (an entirely new airport), to language (certain words had changed). But the most striking change became apparent on the ride to the hotel from the airport. Halfway there, our translator leaned over and whispered conspiratorially,do you notice anything different? And I had noticed, but had been hoping it was a restricted phenomenon. The intersections were now absent of any traffic controllers and were now all equipped with traffic lights. I remember feeling both happy and slightly sad. Happy that North Korea was now able to have traffic lights but sad at the passing of this aspect that had seemed so distinctly North Korean. This ambivalence stayed in the back of my head throughout the trip as I asked myself, why would I be sad at this change? It was a clear sign of progress. Of course I would not wish North Korea to remain unable to implement traffic lights at intersections. But everywhere we went, I regarded the traffic controllers who stood ready to step in, should the electricity fail, with nostalgia. Occasionally we would pass by an intersection that had a vague circular outline in the center, indicating that a platform had once been there. On our last day, as we summed up our thoughts and reflections with our guides, I started to understand my mixed feelings. One of the things we learn prior to and during the trip is juche. A straight translation is self-reliance. Juche has developed into a philosophy and an ideology in North Korea and was frequently cited as one of the reasons North Korea has been able to survive its recent difficulties. Juche has its concrete applications as well: North Korea has worked to develop various products without having to rely on imports and items that can be produced self-reliantly have the name juche attached to them. So we learned about juche fertilizer and juchefabrics, and visited a steel factory that created juche steel. All of these are examples of the juchespirit, but to me, the traffic controller embodied the juche spirit. Without the capacity to implement traffic lights, North Korea had figured out a way to move cars safely through intersections—the traffic controller was symbolic of North Korea’s efforts to live in this world with dignity. Everywhere we went, we saw glimpses of these efforts. Of North Koreans, suffering under division, sanctions, war, nevertheless making the effort to live without fear or shame. The North Koreans have a slogan, nothing to envy. This slogan, often understood to be delusional, is presented as ridiculous by journalists and scholars, most notably by Barbara Demick, who has a recent book out of the same title. But after seeing the changes in North Korea and the way the people are trying to live, it became clear to me this is a misinterpretation of the meaning and intention behind the words, nothing to envy. Wherever we went, people knew they were lacking materially and many knew what the world thought of them. Rather than an act of self-delusion, the use of the phrase nothing to envy signals the North Koreans’ desire to live with dignity and without desperation, and the traffic controller was just one instance of this impulse.